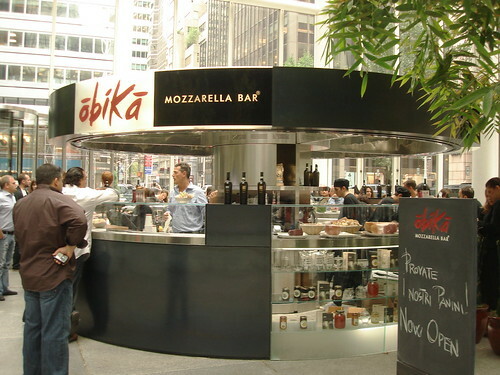 I thought Obika, a Fresh Mozzarella Bar concept from Europe, would do fine in the big cities and may ultimately make a good franchise, succeeding by shadowing the locations of Au bon Pain. I assumed their dozen overseas locations would have been prepared a powerful USA launch. But, the NYC location is not earning universal fondness from New Yorkers. The look is modern and euro, and it has the right formula of escalating a familiar food to a higher level of passion. However, it fails in execution – service is too slow and the sandwiches are simply average. When people are paying a premium ($10 a sandwich), your niche is smaller and there is more pressure to earn repeat business from the local workers. I would imagine they have to do at least 350 transactions per day to break even. Eventually the number of potential new customers will dwindle to unsustainable levels and survival will depend on repeat business. I still think Obika will make it, but the chances of it being a 10+ unit chain in the USA are very slim. Can you expand on what this concept is? I don’t get it. What is a Mozzarella bar? I usually get most concepts, but this one eludes me. I followed the links, and is the idea that people want to eat flavored Mozzarella cheese? Maybe it is a European thing or maybe it would play well in The Village or San Fran or something. Is this essentially a femmed up expensive version of Salad Works that serves wine? I will say the appeal of this one eludes me. The appeal seems to be learning and sampling varieties of an authentic and high end food from Italy, similar to the appeal exploration by aspiring connoisseurs of wine tasting, cigars, or (don’t laugh, this is my vice) fine sipping tequilas. Obika specializes in a particular type of Mozzarella from Italy, di Bufala, which is quite rare in the USA, but sometimes seen in Neopalitan pizzas. I actually had Mozzarella di Bufala cheese for the first time a few days ago at Nella’s Pizzeria in Chicago, and it has a more pungent taste than traditional fresh mozzarella. I did like it but it’s not something I would go out of my way to eat again, especially since it quite expensive. Caprese salad is where most people have had cow’s milk fresh mozzarella. Thanks Ryan. Based on your commentary I’ll say that is a tough market to crack in the states, Americans as a whole simply taste with their eyes. I don’t mean that cruelly but it is the truth, that’s is why our soda has high fructose corn syrup in it rather than cane sugar. As an affirmed apple, raspberry, strawberry, pear and tomato snob I can understand how this concept could have fans but finding enough of them in a locale to make this a go may be very tricky. Obviously a strong demographic study and a bit of intuition would be needed.